Pour paint into bowls and then find a place to set up outside. Place poster board or card stock on the ground where little artists have plenty of room to move around it. Show your little artist how to dip the paintbrushes into the bowls of paint and then sling it onto the paper. Encourage your little artist to “throw” the paint at the paper using the paintbrush. Watch how “throwing” paint at different speeds and from different angles creates splatters of many shapes and sizes. Walk around the poster board or card stock and throw paint from all sides. Each painting only takes a few seconds. For the prettiest paintings, keep a close eye on your little artist’s progress and ask them to help you decide when a painting is “finished,” then create another! Make sure that each time your little artist dips their brush into the bowl, they completely saturate it in paint. The more paint on the brush the better the splatters. This project is successful with children as young as 18 months but is enjoyed by all. Artists of all ages love to see the shapes and lines created by action painting. Prepare to get messy. You may want to dress your little artist in a smock or old t-shirt, then plan for water play after finishing your project fun more outdoor fun that also allows little artists to wash off paint splatters. 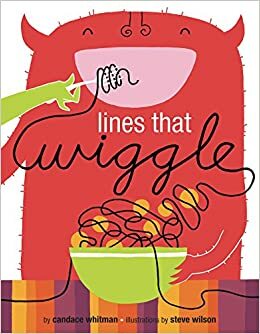 Before or after your action painting project, read the book Lines that Wiggle by Candace Whitman together with your little artist.